Ok folks, there’s a new store in town and I’m loving it! The designer is MissMint and has she got some good stuff for you. Including a beautiful free spring kit that I just had to have this morning, and have managed to actually SCRAP with! Best of all, the layout is totally gorgeous and I love it!! Hehehe got to toot my own horn sometimes!! I love it especially because it has my honey on it. He’s not so impressed, but we’ll wear him down eventually. 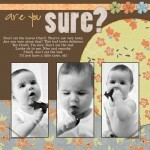 Papers and elements all from Spring Jellybean by Miss Mint. Stitching by Laura Alpuche from her Jack Frost kit, bought at TheDigiChick. Shmootzy alpha from Scrapartist. Fonts used are Arial, CBX Labelmaker and Civilian. Wonderful page. just browsing sites and your caught my eye. Love to see girly, pretty pages. I have all boys and dont get to venture into pinks much. still trying to figure out how to post page layouts. 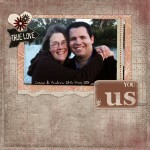 Cass it is so nice to come to your blog and see your layouts. I miss seeing them in the galleries I frequent, and it’s nice to know I can still get my “Cass fix” whenever I need to! Cute stuff!!! I’m keepin my eye’s on this shop!